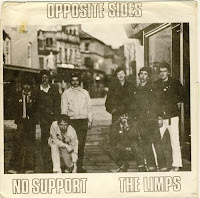 This is the first of two split singles the bands released together on the fine "Matchbox Classics" label. All songs are great D.I.Y. punk. This was the first release of the Matchbox label. Both bands had also one track on the very fine single compilation " 8 from the 80's - A Carlisle Compilation" who was released from the same label. Great !!! I just bought their second one. Many thankx for all, and specially for this. All the best. Many thanks for the re-upload!